selected, Ausline & Lowline cattle. We are a gourmet producer that specializes in quality , tenderness & are in total control of our product from the paddock to your plate. We can guarantee you provenance of our product from conception to purchase. Orders taking now. Free Delivery to Brisbane. What makes our Beef so different? There are three important factors that differentiate our beef from any other product on the market. We know you will be able to taste the difference. 1. Environment. This is range fed beef at its best. At all times our cattle have access to grass and the natural environment as the health and happiness of the animal is foremost. We want our cattle to live in a stress free environment as this has a direct correlation to the quality of the meat produced. As such we rotate the pastures regularly and we engage in low stress stock handling techniques. Our beef is hormone, antibiotic and GMO free. 2. 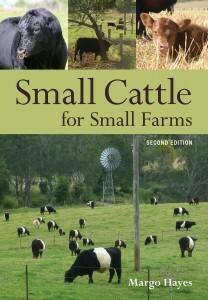 The DNA: Science has proven that smaller cattle have finer grained beef and finer grained beef is the most tender. This, we believe, is due to the shorter cell structure of our cattle. They are, in general, 30% smaller than traditional breeds. We DNA test our cattle for the tenderness gene and selectively breed for it in our herd. Our beef is naturally marbled without being excessive. 3. Nutrition: Our beef is raised on grass for the first 13-18 months and then they are finished with a grain supplement. We don’t feed our cattle urea and instead we maintain the protein content with lupins which provide the highest nutritional value for the animal food chain. Our cattle are fed a diet that has a ratio of the essential fatty acids omega-6 and omega-3 of 4:1 and not 15:1 as happens in the majority of feedlots today so even if our beef is finished on grain the omega-6 to omega- 3 ratio is no different to 100% grass fed..read our meat analysis. So not only is our beef tasty it is also good for you. This is the way meat was meant to taste. Scientific Meat Analysis. 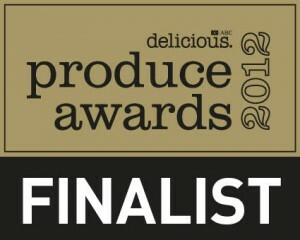 Where Can I Buy this Award Wining Beef? Vitulus sells packs of our home grown, quality range feed beef cut up to your specifications, packaged and even delivered to your door from as little as $15.99 per kilo for all cuts including T-Bone, Rump and Eye Fillet. 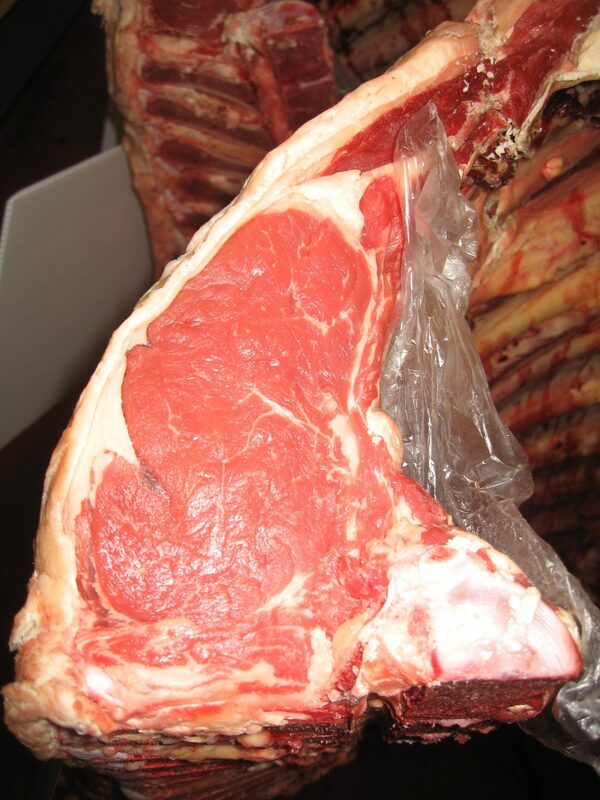 Please note this price is for 60kg packs (1/2 side) only.Smaller packs for 30kg beef (1/4 side) @$19.99 per kg. If you want quality guaranteed beef then our beef is will give you flavour and and tenderness that you won’t find in the supermarket shelves. We care about our product and we manage it personally from the farm right through to the customer . 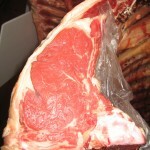 If you would like to purchase our beef then fill out the specification sheet. Orders Now.ORDER YOUR BEEF NOW. Our Carcass Results: Vitulus, to date, has been placed in more carcass competitions than other Small breeder in the nation.Our breeding and marketing program is aimed at satisfying specific markets which include the Lightweight Domestic/ Supermarket trade requirements (slaughter age under 2 years, showing no permanent teeth, with liveweight 300-400kg). 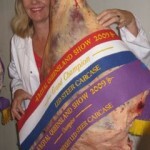 Vitulus Wins Grand Champion Carcass of the Royal Brisbane Show 2009 & 2007. Our greatest achievement was in 2009 because we won both lightweight and heavyweight division. 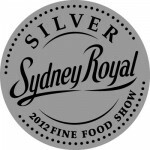 This has never been achieved by another exhibitor in the history of the Royal Brisbane Show. The significance of this win will cement the Ausline position as a serious beef breed as not only does it builds on Vitulus’ previous Grand Champion win in 2007. 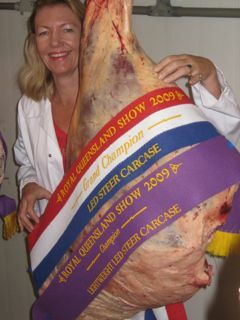 Vitulus Wins Meat Standards Australia Eating Quality Award at the Royal Brisbane Show 2006, 2009 & 2017. Ausline genetics are based on high 200 day growth, moderate 400 day growth and low 600 day growth. With these growth patterns, producers have been able to enter the exclusive end of the domestic market, by producing steers that can fatten and marble off grass or with 60 to 90 days of grain finishing. The commercial advantage begins to emerge at about 12 -14 months as the Ausline starts to mature and begins putting his energy into developing muscle and fat rather than bone growth and body form. The commercial Ausline operator will be producing steers from 300 kg to 350 kg that are already starting to lay down fat. The argument than many breeders of other traditional breeds will have is that their cattle will be 50 kg heavier at this age. Whilst this may be true the difference lies in the cost of getting those animals to an eating standard i.e., the cost of finishing that animal which is the major cost to meat producers. With the early maturity given by a Ausline, producers can sell their stock without the need to supplementary feed. Time and time again we see producers trying to fatten their large framed steers that continue to grow rather than producing fat. As it has been stated Lowlines help ‘down turn’ the high growth curve of regular cattle so that they can mature earlier and express fattening ability at an earlier age”. Another attribute of the breed that is now just coming to the fore as the commercial Lowline beef market expands is the high yield percentage that Lowlines provide. This is expressed as the cut up/carcass yield percentages i.e. : the percentage of meat that remains from the carcass once the bone and fat are removed. These are very important figures for a butcher because when they buy a carcass they purchase the whole carcass so the higher the yield percentage the greater the profit for the butcher. Graham Zahl, one Queensland butcher, who has been in the business for some 43 years, recently gave us yield figures of 76.13% and 74.21% for purebred Lowline steers. This is well above average for any breed. Graham even commented that most of the larger breeds considered 70% as exceptional. His rationale for this high percentage is due to the small bone content and this is most evident in the amount of chuck that the carcasses produced. The steers were, as stated pure-bred lowlines, grass fed with a little supplementary grain and killed at 25 months of age with a 6-8mm fat depth. Vitulus has achieved similar figures with cross bred steers with all yield percentages being well over 70%. In recent comparisons, these animals score favorably in the efficiency of primal cut production when considering eye muscle to body weight ratio. A number of our bulls have had an EMA score in excess of 102cm..pretty impressive when you consider the larger European breeds are often only scoring between 100 and 120cm. This will ensure a clear and continued place for Lowlines in the Beef Industry. 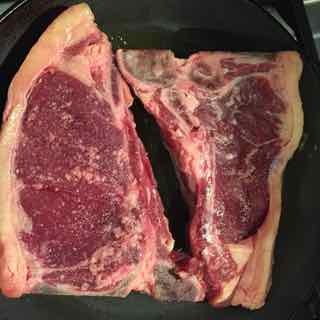 Beef that is well marbled indicates that the monounsaturated/saturated fat ratio is higher. Fifty percent of all marbling is made up of oleic acid (mono-unsaturated), while a relatively small proportion is saturated fat. Another benefit from marbling is derived from a particular component of the omega-6 polyunsaturated fatty acids, called conjugated linoleic acid (CLA). CLA has shown to have anti-carcinogenic (cancer forming) effects as well as being anti-inflammatory. It has a whole raft of health benefits such as reducing heart disease, diabetes and asthma to name a few. Cattle that are well marbled have the highest amount of CLA per gram of any foodstuff due to higher linoleic acid levels. Another factor of CLA is that it is highest in marbling fat, rather than outside fat. The concentration of CLA in fat is highest in pasture rather than grain fed cattle. Lowline cattle in recent DNA GeneStar Marbling tests score favorably and they fatten very well off grass. Our emphasis is on providing range fed beef (cattle that are grown on grass and improved pastures) that is finished on grain for some 60-90 days. We do not use any growth promotants and try to be as organic as possible but at the same time minimising external pests such as ticks and buffalo fly. In keeping with the latest scientific evidence Vitulus steers are fed a diet that has a ratio of the essential fatty acids omega-6 and omega-3 of 4:1 and not 15:1 as happens in the majority of feedlots today. Whilst we have already identified the benefits of omega-6 fatty acids previously the unnatural ratio of too much is unhealthy. We also use sires that have been identified with the DNA marbling, tenderness and feed efficiency gene. As Vitulus has always said we chase the tenderness gene more than any other because we believe that this does affect the quality of the beef more so than any of the recent DNA markers. Recent validation work performed by AGBU showed that marbling and feed efficiency markers were not informative enough to be used in marker-assisted EBVs. Ideally the animals are killed between 18 and 22 months of age weighing between 350 and 450kg. In March 2007 a study released by the University of Rochester medical Centre in New York found that women who ate a lot of feed lot beef while pregnant gave birth to sons who grow up to have low sperm counts. They believe pesticides, hormones or contaminants in cattle feed maybe to blame. Chemical can build up in the fat of animals that eat contaminated feed ad cattle were and are routinely given hormones to boost thier growth. It is interesting to note that hormones have been banned in beef in the EU since 1988.